Many gardeners find that once they have children gardening goes the way of late-night dinner parties and Sunday morning sleep-ins. Raising kids and maintaining a garden can be a juggling act, leaving the family garden forgotten and neglected. But kids can make great gardening companions, and the benefits of including them are impossible to ignore. Gardening gets kids outdoors and away from television and video games, increases their connection to plants and animals, and helps build enthusiasm for fresh fruits and vegetables. Their involvement becomes the real harvest of a family garden. 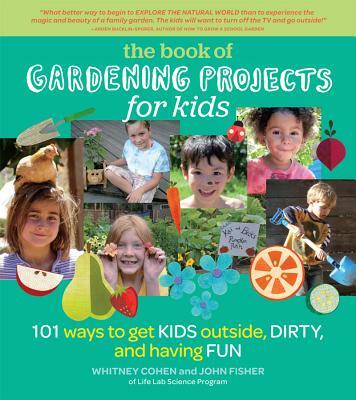 In The Book of Gardening Projects for Kids, Whitney Cohen and John Fisher draw on years of experience in the Life Lab Garden Classroom and gardening with their own children to teach parents how to integrate the garden into their family life, no matter its scope or scale. The book features simple, practical gardening advice, including how to design a play-friendly garden, ideas for fun-filled theme gardens, and how to cook and preserve the garden's bounty. 101 engaging, family-friendly garden activities are also featured, from making Crunch-n-Munch Vegetable Beds and Muddy Miniature Masterpieces to harvesting berries for Fresh Fruity Pops. Whitney Cohen is the education director at Life Lab, a nationally recognized organization that teaches people to care for themselves, each other, and the world through farm- and garden-based programs. Guided by her joy in being outdoors with children, she is the author of the award-winning Kids' Garden activity card set and a contributor to other garden-based learning activity guides. She presents hands-on garden education workshops to varied audiences, including schoolteachers, parents, college students, food service directors, and Master Gardeners across the country. Her expertise in gardening with children comes from years as an environmental educator, a middle school science teacher, a teacher trainer, and, most recently, a mother. Whitney and her husband, Tod, love nothing more than spending time outdoors with their son, Nation. John Fisher has worked as a garden-based educator for most of his adult life, sharing teachable moments in the garden with thousands of children and adults. John designed and has maintained Life Lab’s one-acre Garden Classroom site, has contributed to a multitude of garden-based curricula, and has created videos and websites on garden-based learning, both at Life Lab and at the University of California Santa Cruz Farm. His first memorable gardening experience was as a child harvesting cucumbers and tomatoes in his grandfather’s garden. With his wife, Nadine, and four-year old son, Neli, John tends a small suburban garden plot of fifteen dwarf fruit trees, mixed berries, vegetable and cut flower gardens, and a small flock of friendly hens in Santa Cruz. Seeing his son searching for the ripest berries and feeding snails to their hens puts a smile on John’s face.